A $40 million renovation of Capital One Arena has been underway for months, and the vast majority of the improvements will be finished in time for the Washington Capitals' home opener next month. WASHINGTON — A $40 million renovation of Capital One Arena has been underway for months, and the vast majority of the improvements will be finished in time for the Washington Capitals’ home opener next month. “We’ve actually put a lot of money into the building over the years. 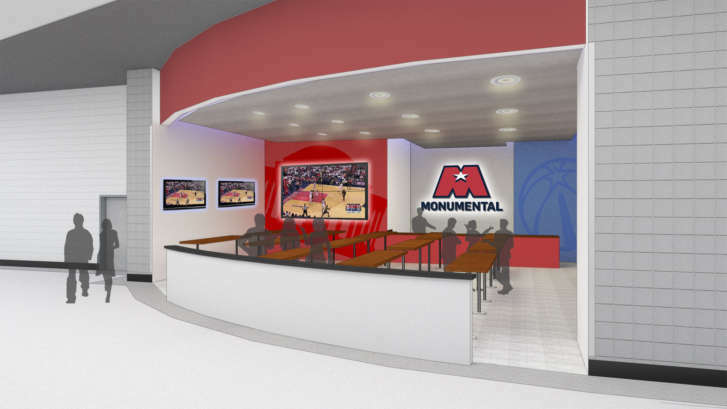 (But this is) the first complete face-lift where the public-facing areas are going to be redone,” said Dave Touhey, president of venues for Monumental Sports and Entertainment. The upgrades include all new, more comfortable padded seats with new cup holders. “The old seats have all been removed; new seats are almost all in. And those will all be done by the end of probably the weekend,” Touhey said. The old seats — which of course were in use during the Caps’ historic Stanley Cup championship run — are being sold online. Prices start at $99, but that’s just for a seat bottom. The concourses on the 100 and 400 levels are being totally redone, and the arena is switching to all-digital signage. And, new food choices are coming, too. “Almost every concession stand has been redone,” Touhey said. The arena continued to host events over the summer as renovation work progressed, except during two shutdowns. One was in July, and the other started in August and will continue for another few days. The next scheduled event is the Drake with Migos concert on Sept. 12.